(c) access information on the network management practices of a consumer’s Internet access service supplier. As a starting point, this is not mandated obligation. 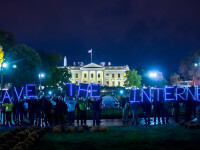 The TPP countries merely “recognize” the benefits of some net neutrality provisions. For those countries without net neutrality rules, there is no requirement to implement anything in order to comply with the agreement. In fact, if there was any doubt about the lack of enforceability, the entire provision is prefaced by the reference to “subject to applicable policies, and regulations.” In other words, the provision doesn’t advance anything for countries without net neutrality provisions.